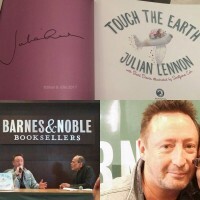 I went to Julian's book signing for Touch the Earth at Barnes & Noble in LA yesterday! Still on a high this morning, as I got to meet him and even got a cheek-to-cheek photo. I got to The Grove around 7:15, and got my wristband when the store opened at 9. I got suckered into buying a membership so I could get a priority seat (which ended up being a good decision photo-wise), went to my volunteer gig and returned around 2ish. The books were pre-signed, so the event was made up of a casual (very casual) interview followed by individual photos. My wristband had a "B" written on it, so I got second row. The security guards - one of whom very much resembled Bull from "Night Court" - were a little confused about the order of things, and had seated some non-members with the members, then told them to move, which was not cool. But things settled down and I chatted with fans. One had flown out from Atlanta for the opportunity. Another fan had a tattoo of Lucy from Peanuts in the sky with diamonds, which she later got Julian to autograph for a tattoo. Julian showed up about 3, and was all smiles. The interview was conducted by his close friend, the photographer of the image for the "Valotte" single (blanking on his name, sorry). The interview started out seriously enough; Julian spoke about the inspiration for the White Feather Foundation, which the book benefits. As he mentioned during the Today show interview, it will be part of a trilogy, and he's open to creating animated projects. He also said that he's finally ready to put together a photography book, yea! And then the interview devolved into Teen Scene-type 20-questions banter. That annoyed some fans, but frankly, I liked that we ended up seeing a lighter side of Julian, since he often comes across so serious on his Facebook page. I wish I'd gotten a photo of this, but when the photographer kind of took the piss out of his friend, Julian gave him one of those temple-rubbing middle fingers. It was very funny. If I see any videos pop up on YouTube, I'll post. Afterward, we each got our individual photos. Bull from Night Court tried to hurry us along, but I think most of us were able to ignore him and get a word or two in edgewise with Julian. After our photo, I thanked him for all he does, and told him that "Valotte" is one of my all-time favorite songs. He thanked me with a smile. Later on, the daughter of a friend got a hug from Julian and another got Julian to pose with her baby, James (named after that James, yes). Even Bull from Night Court finally relaxed and tried to get the baby to look up at the camera. From what I could tell, everyone came away saying that Julian is a complete sweetie. A great day and worth the wait! I think you can still order signed books from that Barnes & Noble. And if you're lucky, Julian's snuck a little drawing in random copies. Edit: Removed, as Paul's representatives have asked other outlets to remove it. I'm sorry, less squeamish, and the picture appeared in nearly every UK newspaper yesterday. which remains available on most major new sites, should be withdrawn from here. I will also report this post straight after I make it to doubley draw attention to it. I just think the decision on this picture should ultimately be Joe's, as one person taking it down - as I'm illustrating - doesn't stop someone putting it back up. There are such pricks on the internet. She's 13! Also who cares how she dresses or who she's interested in....may I repeat she's thirteen! Bea is 13 years old, a minor, and as Paul is her father and wants them not to be published, out of respect for him I don't think they should be here. Going by what the British media do is not a good moral standard for anything or anyone. I can not find the photo anywhere now after doing a quick Google search. Making mean comments about a 13 year old kid? Really? Some people just have nothing better to do, I guess. The photo was removed by most UK media sites and newspapers after Paul's team got involved and said please take it down/stop sharing it. It comes up on google image searches but if you click on the links it has gone. Obviously it's out there as it's the internet but I'd like to think that if Paul, Yoko, Ringo or Olivia asked for something, especially when it concerns a child, not to be shared we would respect such a request regardless of what other sites are doing or have done. I'm very late to this, as I've been away from the site for a couple of weeks. I removed the photo out of respect for the McCartneys. Although I did find it interesting – I've just spent a few days researching the early Wings tours, where the family were photographed all the time. But hey, it's a different time and the media landscape has changed greatly. Sorry it took so long, I decided to list all of the Beatles and Beatles related offspring, but since the page kept refreshing, so I used Family Echo, I made a couple of guesses that I will explain later. The Beatles legend Ringo Starr has been giving his triplet grandchildren music lessons. Lee Starkey, 46, Ringo’s daughter by his first wife Maureen Tigrett says her seven-year-old triplets Jakamo, Ruby and Smokey have become keen musicians after lessons from her dad. I wish Maureen were here to see it all unfold. I could have swore this said 'cook'. I read it twice 'Ringo Starr is teaching triplet grandchildren to cook' and I thought to myself, 'what does Ringo know about cooking?!?!?!' but no it says 'rock', which makes quite a bit more sense. Ahhh that's so cute. They may never do anything with it but it's always a wonderful thing to know a bit about music. I hope Paul helps in teaching them guitar and piano. Great. Another generation for stupid bloody idiots to hound for some kind of Beatles reunion. It could be worse, Ringo could have grandchildren who want to become DJ's instead and then do an EDM remix of The Continuing Story Of Bungalow Bill with samples from Notorious BIG's Juicy thrown in for bad measure. We had to put up this shite forced down our throats on here (I can recall some of the discussion without having to go near the threads), I doubt anything could be worse.